Click HERE to register for the IADC Facilitator Certification (Train-the-Trainer) course. IADC members share the belief that well control is the most critical area for safe and successful operations. Now comprising both drilling operations and well servicing courses, WellSharp offers a set of comprehensive training standards for the international drilling industry. The WellSharp curriculum and assessment content has been developed by the industry for the industry. Please contact your company’s WellSharp administrator to schedule instructor exams. WellSharp certificate number one. 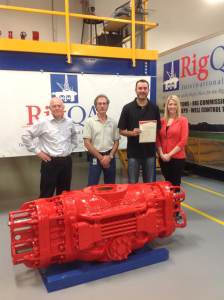 Left to right: Malcolm Lodge, Training and Assessment Consultant, Well Control Institute; Benny Mason, Well Control Training Manager,Rig QA International; Christopher Kobuck, Well Site Leader, BP; Brooke Polk, Director – Program Development, IADC. IADC is proud to offer WellSharp–a revolutionary well control training and assessment program. The result of a collaborative industry effort, the WellSharp program emphasizes rigorous training for every person with well control responsibilities, whether office- or rig-based. Trainees gain more in-depth knowledge, well-honed role-specific skills, and a greater confidence that they know what to do to prevent incidents or, in the unforeseen event of a well control incident, respond swiftly and appropriately. Learn more about the program enhancements. The WellSharp program, which evolved from WellCAP, was created at the request of industry. WellSharp represents an industry-led effort to redefine well control training and assessment. IADC members–representing operators, drilling contractors, well servicing companies, professional trainers, and well control specialists–developed the WellSharp program in collaboration with the WellSharp Advisory Panel, the IADC Well Control Committee, and other industry groups. The content-specific workgroups set quality benchmarks and criteria to ensure that accredited training providers adhere to a core curriculum and to content delivery and assessment requirements. The WellSharp accreditation applies to Drilling Operations and Well Servicing tracks of training. A new WellSharp Plus course, which is an updated and expanded version of the former WellCAP Plus course, will be available by the end of 2018. This “Plus” course integrates the learning of technical and nontechnical skills through fully team- and scenario-based content delivery. A new Drilling Operations Engineer (well design and planning) course will be available in 2019. WellSharp offers the building blocks for a comprehensive well control culture throughout an organization. Awareness—Designed for support personnel who do not have direct well control responsibilities but need to understand basic concepts. Introductory—Essential well control knowledge for rig crews, including floorhands and other non-technical personnel. Driller—Addresses practical well control skills, with a focus on detecting a kick and shutting in the well, for assistant drillers and drillers. Supervisor—Designed for toolpushers, superintendents, drilling foremen, and company men and focused on well kill procedures. Engineer—Addresses well control issues that can be minimized or avoided through well design. Coiled Tubing—Designed for service company equipment operators who are primarily responsible for the coiled tubing operational processes of well control. Snubbing—Designed for service company equipment operators who are primarily responsible for the snubbing operational processes of well control. Wireline—Designed for service company equipment operators who are primarily responsible for the wireline operational processes of well control. At the request of industry, the WellSharp program (formerly WellCAP*) was fully redesigned by industry workgroups collaborating through IADC. WellSharp essentially aligns with IOGP Document 476, developed by Operator representives. One of the reasons for taking on this challenge was the general agreement that the industry should make every effort to regulate itself, or to provide the foundation for any future regulations and standards. The WellSharp program is designed to provide trainees with more in-depth knowledge, with well-honed role-specific skills, and with a greater confidence that they know what to do to prevent incidents or, in the unforeseen event of a well control incident, respond swiftly and appropriately. Developed collaboratively by the IADC WellSharp Advisory Panel, IADC Well Control Committee, and other industry workgroups, the WellSharp program represents an industry-led effort to completely redefine well control training and assessment.